An immensely beautiful city, Grand Rapids is home to a number of wonderful attractions like historic neighborhoods, iconic landmarks, brimming rivers, world class museums, top notch art galleries and much more. On a two-day holiday to Grand Rapids, you can do a lot of things including sightseeing at your own leisure, dining at the best restaurants, shopping in nearby malls and enjoying the vivacious nightlife of Grand Rapids. Since there is no best time to visit the city, you can plan a holiday anytime of the year depending on your climate preference. Start your first day in Grand Rapids with a delicious breakfast at Wolfgangs (1530 Wealthy St SE), which is known for their sumptuous Tiramisu pancakes, Uncle Ron’s Skillet and homemade hash browns. Another popular breakfast joint in the city is Anna's House (2409 E Beltline Ave SE). With three locations, Anna’s House is fairly new to the city but has made an impression with their old-school atmosphere and use of only fresh and natural ingredients. Ranked among the top thirty museums in the globe, Frederik Meijer Gardens & Sculpture Park is famous for its 132 acres of green spaces along with beautiful bronze sculptures. While the indoor galleries are filled with wonderful sculptures made by prominent artists, the beautifully landscaped botanical gardens outdoor are surrounded by multi-colored flowers, tall trees, exotic plants, waterways and paths. Some popular gardens include Arid Garden, Carnivorous Plant Garden, Japanese Garden, Victorian Garden, Seasonal Display Garden and many more. As the name suggests, Grand Rapids Children's Museum is one of the most famous museums to visit with children. From interactive hands-on exhibits to informative displays, the museum offers exciting opportunities to enhance the development of the child. Some popular exhibits include Aunt Daisy’s Farm, Wee Discover, Mom & Pop Store, Treehouse, Wee Bank, Buzzy Buzzy Bees, Giant Lite Brite and many more. One of the most famous landmarks of Grand Rapids, La Grande Vitesse is the first public work of art in the city. Made by a famous American artist - Alexander Calder, this popular sculpture is 54 feet long, in 43 feet in height and 30 feet wide. Located near the City Hall, the red colored La Grande Vitesse is French for ‘the great swiftness’, which can also be translated to ‘Grand Rapids’. If you are in a mood for fresh seafood, then head towards Leo’s (60 Ottawa Ave NW), who are known for their beautifully presented food in a romantic setting. For a fusion of Thai, Japanese and Chinese, head to XO Asian Cuisine (58 Monroe Center St NW). Sushi Yama (146 Monroe Center St NW) is another great place in the city for freshly rolled sushi. Originally established in the year 1910, Grand Rapids Art Museum (GRAM) was renovated in 2007 with a new eco-friendly building and was named as the world’s first-ever LEED certified art museum. Home to several precious 19th and 20th century art pieces, photographs, sculptures, prints, decorative arts and paintings, the museum is even famous for its modern artworks. On top of that, GRAM also holds a number of exhibits throughout the year. Established in the year 1869, Fountain Street Church was known for being broadminded and non-denominational in an otherwise conservative city. Originally called the Fountain Street Baptist Church, it gave up its Baptist name in order to become a liberal and an independent church. A great place to visit for concerts, movie screenings, performance arts, artist receptions, gallery talks and more, Urban Institute for Contemporary Arts was build on the grounds of freedom of expression and unique works of art. It also hosts a number of exhibitions throughout the year by various famous artists. A popular place in the city for shopping and just roaming about, Gaslight Village is an old-school village with a number of eateries, salons, financial service companies, fitness centers, shops, commercial services and health and wellness centers. It is a must-visit place in the city and will transport you to a period where there were gaslights instead of electric streetlights in Grand Rapids. Situated right next to Gaslight Village, Reeds Lake and John Collins Park are two of the most beautiful attractions in the city of Grand Rapids. Named after John A. Collins, mayor of East Grand Rapids, the public provides easy access to many beautiful places like the boat launch to Reeds Lake, overlook decks, rain gardens, public restrooms, benches, lakeshore walk and event spaces. Located right next to John Collins Park is the beautiful restaurant of Rose’s (550 Lakeside Dr SE), known for its delicious Mediterranean and Italian dishes and a gorgeous view. Another popular restaurant in the city is the Grove (919 Cherry St SE), which is known for providing one of the best farm-to table experiences in Grand Rapids. For a fun night out with friends accompanied by unique cocktails, craft beers and pulsating music, head to The B.O.B (20 Monroe Ave NW). However, if you are not in a mood for dancing and loud music, then head over to Meanwhile Bar Inc (1005 Wealthy St SE), known for its art-decked walls and an old-school jukebox. Grand Rapids Day 2 Journey Begins! Brandywine Restaurant (1345 Lake Dr SE) in Grand Rapids is a great place to visit if you want the traditional American fare like eggs, burritos and wraps. Cherie Inn (969 Cherry St SE), an upscale breakfast joint, is another popular place in the city that is known for its Parisian ambience and inspired dishes. If you are a nature lover, Blandford Nature Center is the place for you. Spread over 143 acres, this natural center is filled with expansive green spaces, woods, ponds, streams, overlooks, trails and verdant fields. They also host a number of children’s programs, each of which aims at environmental education, sustainable living and interaction with wildlife. 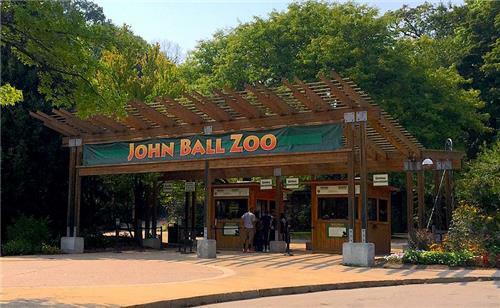 One of the most popular tourist attractions of Grand Rapids, John Ball Zoo is a fun, adventurous zoo, located just two miles from Downtown Grand Rapids. Famous for its 2 story rope courses and 300 foot zip line, the zoo is also home to 1100 animals including grizzly bears, chimpanzees, Komodo dragon and lions. It is divided into different habitats like South American Boardwalk, North American Trek, Far Side of the World Trail, Mokomboso Valley Chimpanzee Exhibit and more, each displaying something new and unique. Besides that, the zoo also has a tram ride, camel rides, picnic spots, boating and many more exciting activities. After spending time with the zoo animals, head to Vito’s Pizza (658 Fulton W) for a delicious lunch filled with freshly baked pizzas. For classic pub food and Mexican favorites, Fultan Street Pub & Grill (801 Fulton W) is another great place to eat nearby. Named after Gerald Ford, the 38th President of United States, Gerald R. Ford Presidential Museum is another great tourist spot in the city. From several permanent and temporary exhibits to being the burial grounds of Gerald Fort and wife – Betty Ford, the museum gives us a lot of insight and information about the president and his wife. Popular displays include replicas of the Oval Office, Cabinet Room, Berlin Wall, Watergate Gallery and 1976 Bicentennial Display. Founded in 1845, Grand Rapids Public Museum is one of the oldest museums in the country. With a wide collection of both permanent and temporary, each of which represents the rich culture and history of the state. Moreover, for a more real life experience, the museum has even re-constructed a street to resemble the one in 1840’s. There is also a fun 1928 Spillman carousel and a 145 seat planetarium featuring daily shows. Situated right next to the Grand River, DeVos Place Convention Center is a popular place in the city for concerts, comedy shows, family shows and other events. In the year 2002, the convention center revealed a new lobby complete with an extravagant terrazzo floor and a new box office. From Colonial Revival to Greek Revival architecture, Heritage Hill Historic District has 1300 Prairie style homes and is also one of the largest historic districts in the country. Dating back to 1843, these homes once belonged to judges, barons, teachers and legislatures that played an important role in the development of the city. Do visit the Meyer May House that was built between the years of 1908 and 1909. After two fun filled days of sightseeing, it is time for some shopping. One of the most premier regional malls of West Michigan, Woodland Mall has several major stores including Macy’s, Sears, Barnes & Noble, JC Penny, Gap, Forever 21, H&M, The North Face, Apple, Pottery Barn, Vera Bradley and many more. There is also a movie theater, a food court and several sit down restaurants. After shopping, you can either eat at the food court or try one of the restaurants in the mall. But if you want something more, then head to Brann's Steakhouse & Grille (401 Leonard Street Northwest) for a delicious sirloin steak. Grand Rapids is known for its fresh farm to fork experience. Bistro Bella Vita (44 Grandville Ave SW #100) is one such restaurant that uses only the freshest of the ingredients in their dishes. Enjoy your last day in the city with a bang! Billy's Lounge (1437 Wealthy St SE) is one of the most popular places in Grand Rapids for live music and concerts along with a huge dance floor, fully stocked bar and delicious cocktails. For something more unique, head to Grand Woods Lounge (77 Grandville Ave SW), known for its vibrant atmosphere and a wide number of performances.